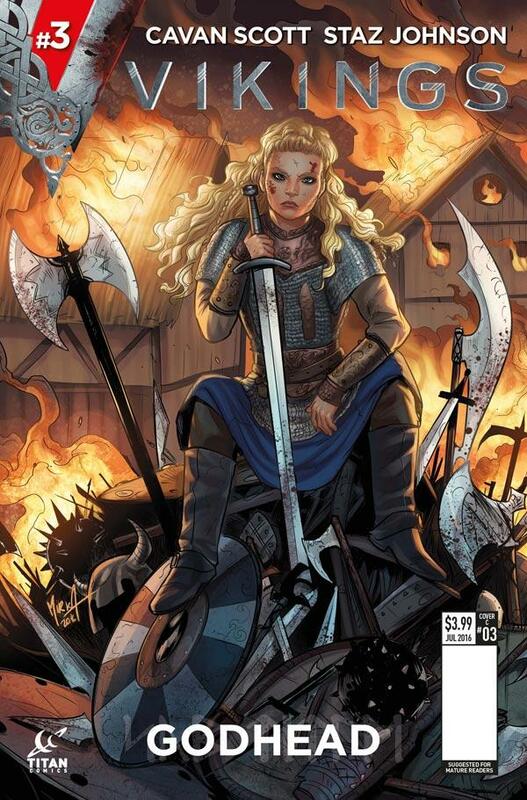 VIKINGS #3 Review @comicstitan | Warped Factor - Words in the Key of Geek. It's Viking vs Viking. Tony is your referee. In the second issue of the Vikings comic-book, writer Cavan Scott (he of the massive comic-geek heritage and the Whoish streak) used 8th century Wessex as an allegory of the world in which we find ourselves today, differences of religion, of territory, of approach to life making the world of Wessex a very spiky place to be a Viking. Ragnar Lothbrok, trying to broker a deal with King Ecbert of Wessex to establish a place for the Norsemen in these strange but fertile southern lands takes on an assignment to dissuade another group of Norse raisers from doing their Viking thing. Sometimes you just can’t catch a break – not only does Ragnar have to cope with the bitching of his friend Floki, who’s something of a religious purist and doesn’t want the Norsemen to associate with these Christians or their fairy tales, but some of Ecbert’s lords, unhappy at the growing amity between Lothbrok and their king, have sent a scouting party to ambush the fairly literal bejesus out of their Norse asses as soon as they set foot on dry land in search of their troublesome countrymen. Then of course, there’s the troublesome countrymen themselves to deal with. It’s a whole mess of fire and steel and shifting perceptions, fuelled by religious intolerance and bad press. As we left issue #2, the ambush was about to be sprung and all varieties of hell were about to be let loose. One thing about Cavan Scott – he’s not afraid of the rule of Chekhov’s gun. Chekhov’s gun? No, nothing to do with Star Trek, O my geekbrothers and nerdsisters. The rule of Chekhov’s gun says if you introduce a gun in the first act of a story, you must be prepared to fire it in the second, or you’re just wasting everybody’s time putting it there in the first place. Issue #3 opens with a solidly Vikings-style gun going bang. Really rather a lot. Classic battle action, narrated in this instance by Lagertha, ex-wife and currently powerful shield-maiden and earl in Ragnar’s band. She charmingly notes that her ex-husband thinks the sun shines out of his own behind, and that he’s wrong, but he’s her king, so she’ll fight with him till the last. It’s important to note that the ambush by the double-dealing Wessexmen actually ends with the Vikings on top – this comic-book, and this series, makes no mincemeat of the fact that these were proper, trained, vicious-as-need-be badasses, so to paraphrase some bowtie-wearing numpty, if you have any plans of seeing tomorrow, you never ever want to put them in a trap. One Wessex survivor is all it takes to turn the tide of events though. One survivor who happens to be the son of a Lord, and as such is valuable in terms of parley or threat. By the expedient of not hacking off his head, Ragnar brokers a deal, persuading the Wessex lords they’ve been misinformed of his intentions, and that there’s a second band of more aggressive Norse troublemakers stinking up the coast. There’s a point here – while Felman, leader of the troublesome Norsemen, is built like a high hall and his men are just as well trained, if not more well trained than Ragnar’s, it’s not simple brute force and a flaming torch that rules the day. Ragnar uses brains, patience, a little well-placed threat but mostly the example of himself and his band to barter help from the Wessexmen, staging an ambush of their own for Felman’s horde. In that, he shows the differences between a thug and a leader. He does not come seeking violence, but if there’s to be violence, he makes allies, he chooses the place, and he gives himself and his supporters the advantage of surprise. Go into the world as farmers and sailors by all means, but if you’re going to have to fight, get friends, and make sure you win. It’s this combination of strategy, diplomacy and patience that marks Ragnar out from the majority of Viking leaders – he elevates their battle strategies from simple raiding to include diplomacy, and in a very real sense he thinks about the day after the battle, about who will speak for him to their friends, their lords, and how to get to his ultimate goal. That’s part of what makes Vikings so fascinating – the story of a leader extraordinary in his own time, and those who follow him. There’s trouble still at Kattegat in this issue too, between the three women who have dominated events since the comic-book began. The tension between Queen Aslaug and Siggy the arguably ambitious simmers to a head in this issue, notably driven by the schemes of Jaska, the troublesome blonde who Aslaug put to trial in the opening issue, but who withstood the pain of hot coals and was exonerated of the accusations of witchcraft and bringing a curse on the village and its harvest. Having withstood the trial though, Jaska has ideas of her own about the cause of the ‘curse’ – and she points the finger at Ragnar’s infant son, Ivar, born a cripple in an age of dark omens. The contrast between the success of Ragnar and the rising tide of tension back home means Vikings #3 is a neatly balanced issue – it gives you your hellyeahs in the victory of our Viking-king and lets you celebrate the reasons behind the victory, but it never lets you exactly relax, and it draws you on as much with the Kattegat storyline as the Wessex one to find out what happens in issue #4. This division of the threads and their outcomes carries through to the artwork, with Staz Johnson delivering the Wessex art and Andrew Mutti on Kattegat duties. Johnson is clearly having himself a good war – the ambush sequence goes on for a gratifying length of time, and he gives is both the brutality you’re more used to from the big screen, and a traditionally drawn look from comic-books of decades past. Mutti maintains consistency with the style, but makes everything a little more composed, a little more steady, carrying through the logic of the Scott’s storytelling – war and diplomacy are ragged, untidy arts, but at home, these Vikings are civilised. It brings a House of Cards vibe to the whole thing, especially when matched with the bubbling tensions of Scott’s Kattegat storyline. When away from home you can live or die on the swing of an honest or deceitful axe, but at home in Kattegat, it’s words and whispers that can bring the sky crashing down on your head. 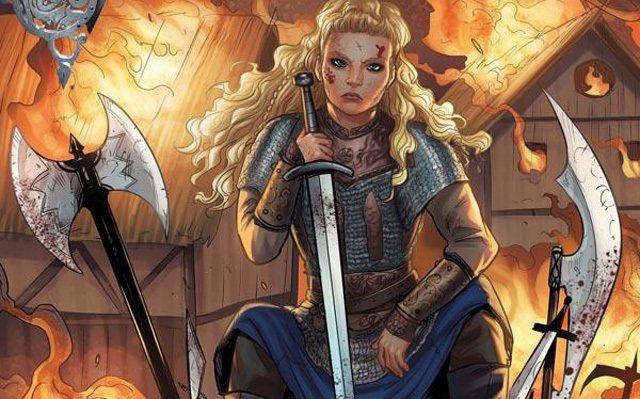 It’s a cleverly put-together storytelling Easter Egg, this matching of styles, and it works to make Vikings one of our favourite comic-book series of the year. Pick up issue #3 today and check it out for yourself – whether at home or abroad, the Vikings will repay the investment of your time.